Oh, and I should mention that we did this epic long adventure with 7 children, the youngest only 6 years old. The Tent Ridge Horseshoe Trail is located in Spray Valley Provincial Park behind Mount Engadine Lodge and near the Mount Shark Trailhead. The best description for trailhead and route comes out of Gillean Daffern's hiking book: Kananaskis Country Trail Guide, Volume 1. The book is available anywhere that you buy books (MEC, Chapters, Amazon...) and I'd recommend putting it on your Christmas list if you're serious about taking the kids on this hike next summer. There's also a description for the route and trailhead on Trail Peak, a GPS track on the All Trails Site, and a good write up on Bob Spirko's website. From the Kananaskis Trails website you'll get the basic directions for starting your hike. Beyond that, the links above should help you with "where to go" from the trailhead. Know though that this is an unofficial trail. You can and could easily get lost if you don't know where you are going. There were moments where we wondered if we were en route after leaving the ridge and trying to follow trails back to the road. I highly encourage you to hike the trail without kids first (which I've done several times,) and to bring somebody with you who is awesome at route finding! In this case for us, it was my friend's husband who corrected me right from the get go when I was about to start up the descent trail! 2. When you come off the far end of the ridge, closest to overlooking Spray Lake, just follow the main trail all the way until you end up on an old road. This takes you to the official road where you parked, just up from your vehicle. We wondered constantly if we were on the right trail, if we had to turn off somewhere, if we should turn onto any of the side trails... - no. Stay on the main trail. It is the correct one. Gillean's book is a bit confusing here as she talks about loops and such. Just go straight. On the main trail. We enjoyed the relatively easy hike to the meadow below the ridge in Monica Basin. It was uphill for sure but the height was grained gradually and it was never that steep. It took us perhaps an hour to reach the ridge. None of the kids had problems on this first part of the trail and we stopped occasionally for candy breaks. The only crux was finding the right trail to get started. As mentioned above, from where you'll park your car, hike DOWN the road a short ways to find the trail heading off into the trees. Do not walk up the road. There were several parties at the trailhead at the same time as us and most of them followed the trail UP the road from the car park. We didn't see any of them on the ridge so I think they just tagged the one summit and headed back down. Once we got to the far left hand side of the horseshoe shaped ridge, we proceeded to scramble steeply up to the first summit. There was one cliff band that was especially "technical" for 6 and 7 year olds and a rope came out when one of the moms expressed a bit of doubt. 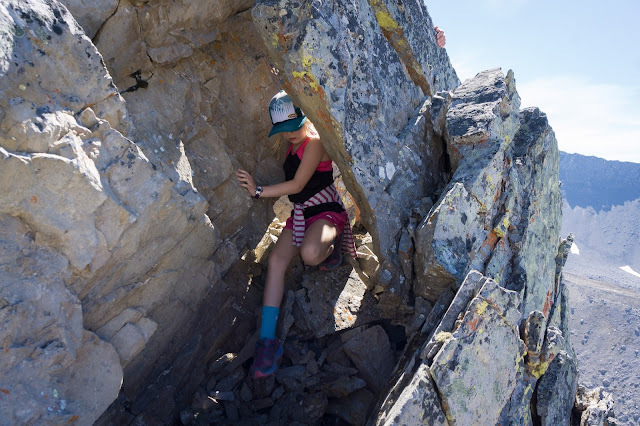 This first part of the Tent Ridge Traverse was also the point we almost "lost" two families, debating whether they should turn around or not, but fortunately the hiking got easier and everybody decided to continue. Guide book writers will say Tent Ridge is "not" technical. And for an adult it isn't. There were several scrambly bits on the first third of the ridge walk leading up to the first summit. Once we got further along though, it was all hiking on top of the ridge and hands could go back in the pockets (so to speak) for most of it. I lost track of where the actual "summits" were with all the up and down we did, but I'm pretty sure it was the first summit that had this firenet repeater station on it. It made for a good lunch spot and we stopped here for at least half an hour. Hiking to the Second Summit or the "Hub"
The hiking was much easier past the first summit but first we had to hike way DOWN off the summit and then way back UP to the next one. The kids were a little less than "thrilled" to be losing height only to re-gain it, but they all made it up to the Hub in relatively good spirits. The photo above is really good for showing how far we had to hike down off the first summit. We took a lot of breaks! According to guide books, we were only starting the actual "Tent Ridge" traverse past this point. Up till now, we'd been traversing a connecting ridge in a horseshoe shaped hike. Many people hike this portion of the hike only to the "Hub" by hiking up in the reverse direction and skipping the whole horseshoe. They hike up and down our descent trail, tag the Hub, and hike back the same way without doing the big long horseshoe shaped ridge walk. We could have done just the Tent Ridge hike too but I prefer doing the whole Horseshoe and it gave us 3 summits instead of 2. 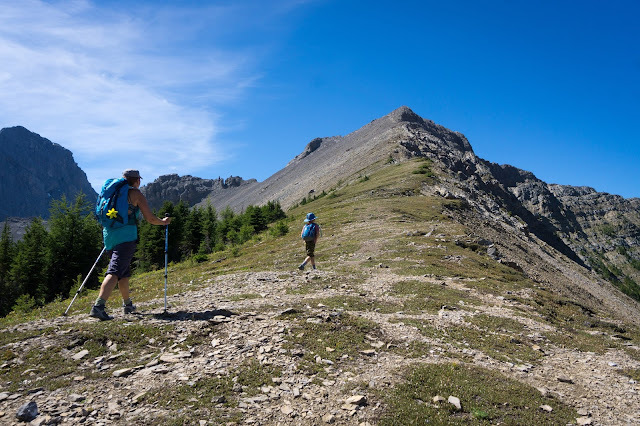 If you want to do Tent Ridge without the connecting horseshoe, Daffern describes the Tent Ridge hike in the same trail guide and has two different entries for "Tent Ridge" and the "Tent Ridge Horseshoe" that we did. We probably should have supervised the kids a bit more here but they did AWESOME! The photos above give you a good look at how exposed or narrow the ridge got at times. Not a problem for most adults but for young kids, it certainly was committing. And again, I'd forgotten just how narrow the ridge is from the last time I did the hike without kids. I love the photo above because it definitely puts the ridge in perspective and lets you know how narrow it was at times. Kids definitely need good balance, to be solid on their feet, and to have previous experience with scrambles and advanced hikes. The photo above gives a LOT of perspective. We hiked DOWN that ridge behind our group in the photo. We climbed down those cliff bands, we scrambled all that black rock, and we made it safely down from the Hub in the background at far left. Honestly, the top bump in the photo on the far left hand side is where we hiked down from. It certainly looks scary from this vantage point and were we to have been hiking up, we may have gotten scared and turned around at this point. In reality, it was fine and was a lot of fun. The hiking got a lot easier as we got closer to the final summit overlooking Spray Lake. The views also got amazing the further we hiked. And at this point, the kids had been hiking for 4 hours I'm sure. Probably more if it took 7 hours in total. The third summit was probably the most beautiful with Spray Lake below us. The kids were getting tired by this point, and we still had another couple of hours to go before we'd reach the cars. Fortunately, it was all DOWN from this point and that certainly got the kids going!! What was the hike down you are wondering? Steep! Steep as hell. Lots of scree, loose, and easy to slip on. I made my son put on his bike gloves at this point and tried to encourage him to walk slowly. Of course he still ran and thought it was hilarious to descend on his bum much of the time. Thankfully his shorts have no holes in them as a result! Only one of the kids got a big banged up taking a big slide down the scree and the rest had minor slips. It was definitely the steepest slope I feel like descending with kids though. Sadly I don't really have any photos of the final part of the hike, nor do any of the others so I suspect we were all in "get back to the car" mode at this point. Add on a bit of "survival mode" getting the kids safely down the steep scree to the trail below. Once we got back into the trees, we just followed the main trail all the way to the road - where we all gave loud war whoops that we actually ended up right at the vehicles! We weren't sure if we should follow the side trails, try to loop back to our ascent trail, or just follow the main trail we were on. In the end, the main trail was a great one and we ended up just up the road from our cars, clearly in site. 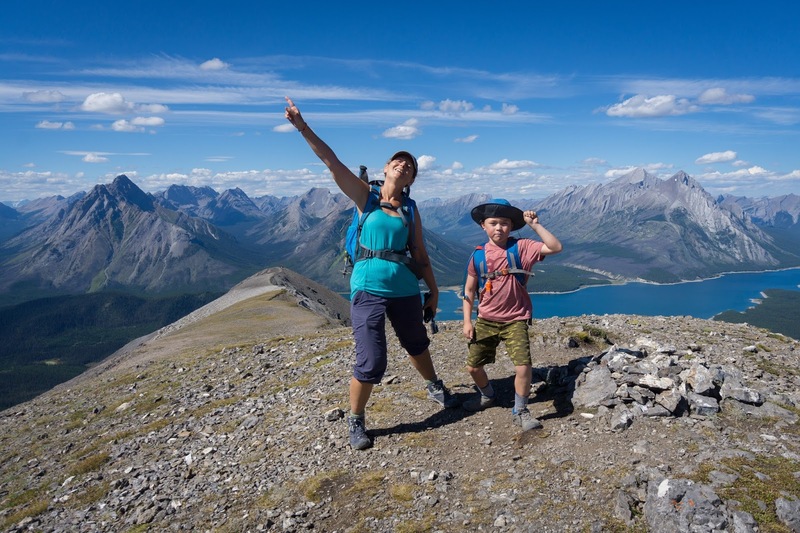 Want to do this hike with your kids? Please get a guide book (recommendations at the beginning of this post,) research your route ahead of time, and go with a strong group of hikers. Do a reconnaissance hike first without the kids as well. That way you'll know if it's too narrow, exposed, technical, or long for your family. We had a great day but I know this hike is NOT for everybody. 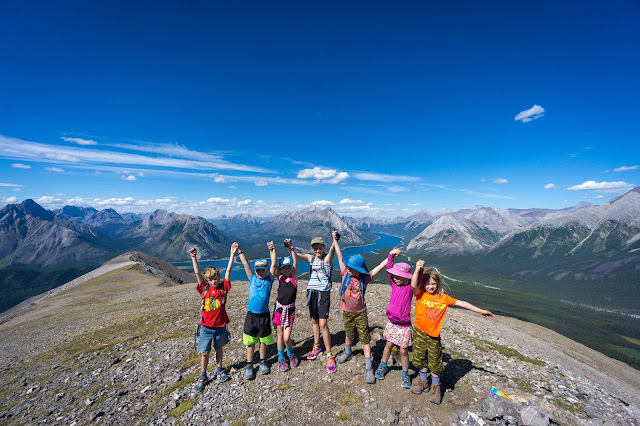 While we had children as young as 6 on this trip, I wouldn't really recommend kids under the age of 8-10 attempt Tent Ridge (unless the kids have a lot of previous experience hiking or scrambling.) We had a strong group of children that I would not say are the "norm" for this sort of hiking. Mighty Kids doing Mighty Things! 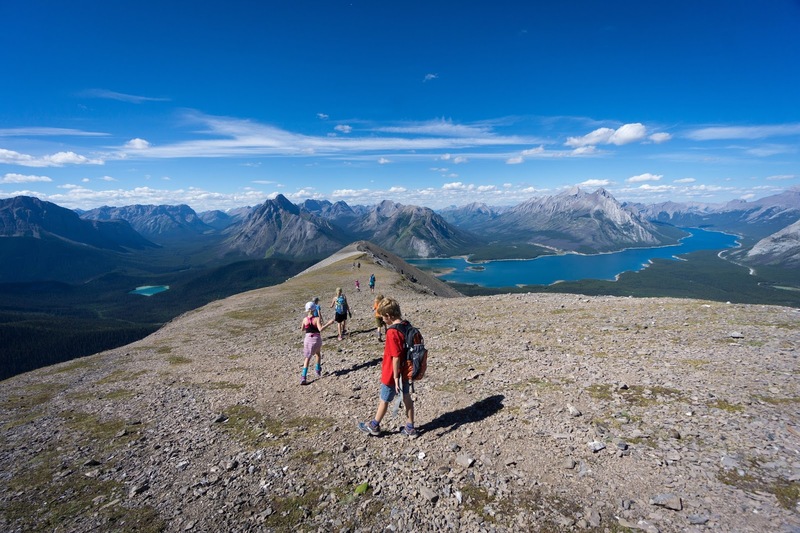 To read about some of our other summits this summer check out my last story on the East End of Mount Rundle. It has a lot of reflections in it, learned over the summer. It also has a complete link at the bottom to all of my "First Summits" posts. This is a great hike with kids. The views are spectacular.